Julie began as the Associate Pastor, became the called Senior Pastor and for the last 20 years has served as co-equal partners with Mike Fronk, her husband. She is a Southern California native and experienced the dynamic and sometimes difficult change through which the region has developed. She majored in music at Chapman University, receiving a Bachelor of Music and values the place of music in the life of the church. She received the Master of Divinity degree in 1988 and the Doctor of Ministry in 1993 from Claremont School of Theology. 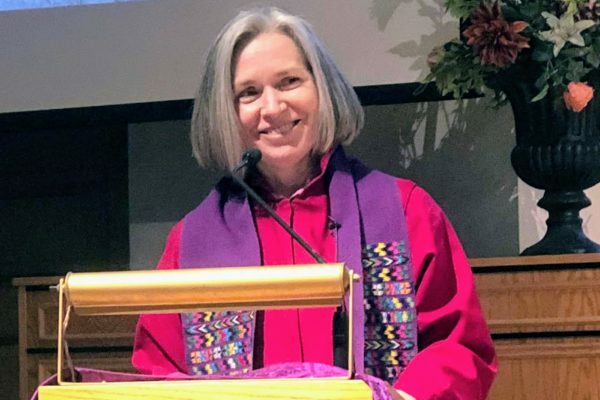 In the time Julie and Mike have served, the congregation became an Open and Affirming congregation, reconnected more intentionally with Hope Partners and engaged more deeply in the communities around the church through Inland Communities Organizing Network (ICON). The congregation has always had a strong call to serve beyond its walls. Julie and Mike led the congregation to engaged action with people of other faith institutions and non-profits locally to build power for the common good. Spiritual formation is a passion for Julie. She is a Facilitator for Engaged Compassion through the Center for Engaged Compassion, has led numerous retreats and plans for worship to a place and time where we intentionally stand on the threshold of divine presence. julie@fccpomona.org or call at church (909) 622 1144.